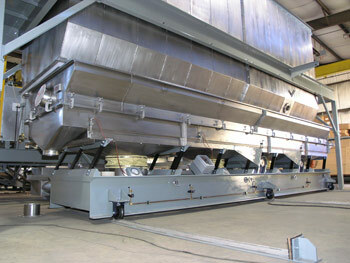 Washington, NJ: Vibrating fluid bed dryers and coolers from process equipment manufacturer The Witte Co., Washington, New Jersey (www.witte.com), are available mounted on rails (optional) to allow easy, unobstructed access for cleaning, maintenance and visual inspection. During washdowns or for product changeovers, the entire drying and cooling sections spanning the complete length of the thermal processing system may be rolled out by one person and then rolled back into place without any tools. Specified for high-capacity fluidized bed dryers and coolers where access for inspection and cleaning are paramount, the rail-mounted vibratory dryers and coolers are ideal for foods, pharmaceuticals, chemicals, aggregates and other products that require dry processing. The steel rails include cushioned bumpers and are mounted into the flooring during dryer installation.